By the time I finished reading what current UC Berkeley Chancellor Nicholas Dirks had to say on the occasion of Nelson Mandela's death in early December, I was ... let's just say taken aback. It turns out that dozens of fellow-activists in the Campaign Against Apartheid -- a student, staff, and community group that played a prominent role in Berkeley's anti-apartheid movement of the mid-1980s -- felt pretty much the same. Sixty-one of us signed an op-ed published today in the university's student newspaper, the Daily Californian; more signatures are still trickling in. I'll include the unedited text of the op-ed and the full set of signatures at the end of this post. On the day Nelson Mandela died, 5 December 2013, there was nothing to be taken aback about in Chancellor Dirks' homage to a man whose long, honorable, and storied life spanned the roles of lawyer, non-violent activist, armed revolutionary, political prisoner, Nobel Peace Prize laureate, South Africa's first post-apartheid president, and modern archetype of principled resolution. Today, we are all part of a global community united in grief and reverence for a man whose clarity of moral purpose and extraordinary perseverance brought freedom to the oppressed, hope to the hopeless and light to all the dark places where human dignity struggled to survive. Today, we pause to not only mourn, but also to reflect, with gratitude, on the good fortune we had to witness in our times all that Nelson Mandela accomplished and exemplified. True enough, and I was glad that the leader of my alma mater (and current employer) saw fit to honor Mandela on behalf of himself and of UC Berkeley as a whole. But consider that during the mid-1980s anti-apartheid movement, the University of California administration stood in direct opposition to the students, staff, faculty, and community members demanding that UC divest its portfolio of multiple billions of dollars in investments tied to apartheid South Africa. In fact, the university administration and governance board were the target of the anti-apartheid movement's divestment demands. 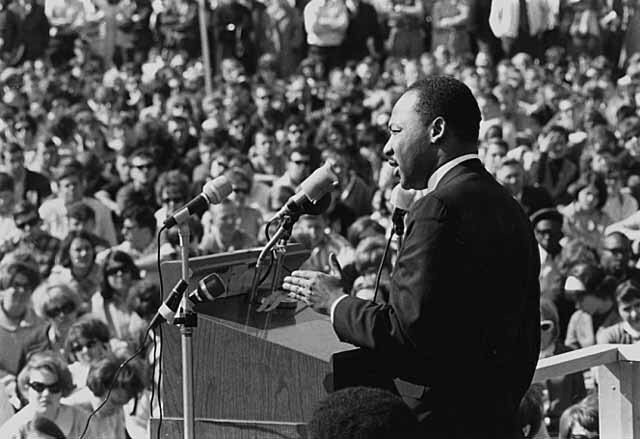 At Berkeley we also remember the special ties that will forever bind our campus to this man and his movement. As we know, the Bay Area was the epicenter of the American anti-apartheid activity due, in no small measure, to the passionate engagement of Berkeley students. In 1990, on a worldwide tour after serving 27 years in prison, Mandela spoke to a crowd of 60,000 at the Oakland Coliseum. During that speech South Africa's future president specifically cited our university’s "Campaign Against Apartheid" as having been particularly significant in hastening the end of white-minority rule in his country. That recognition highlights what is, in my opinion, one of Berkeley's proudest moments. One of the university's proudest moments? That Berkeley's solidarity movement registered on Nelson Mandela's map of international struggle for justice in South Africa? Yes, Chancellor Dirks got that right too. I opposed divestment for reasons that I thought were sufficient. [...] After having studied the issue very carefully I concluded that the university, I'm not talking about individuals, the university acting collectively as a corporate entity ought not to divest. We didn't invest in South Africa because of apartheid; I thought we shouldn't divest because of it. And there were a lot of other arguments for remaining as against leaving. 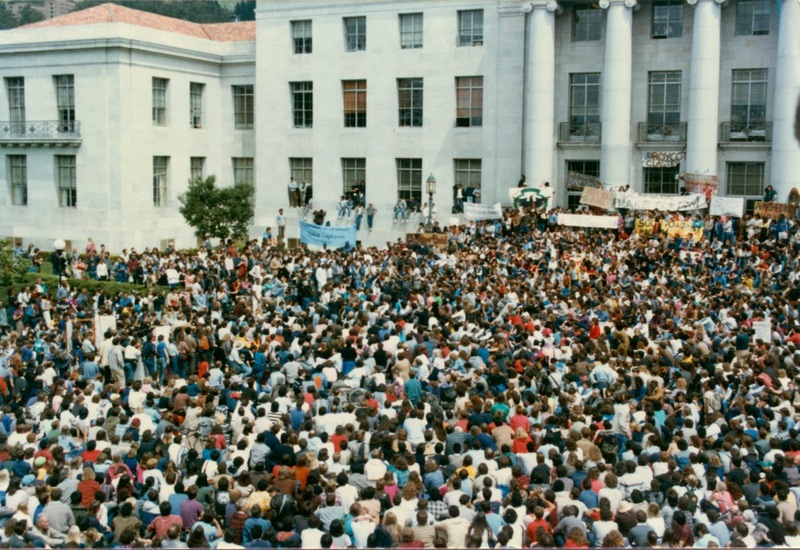 The anti-apartheid movement of the mid-1980s -- including all the thousands of Berkeley students, staff, faculty, alums, and community members who participated in it -- was on the right side of history. The UC Berkeley and University of California administrations, and the UC Board of Regents, had to be shamed, badgered, and ultimately cornered into doing the right thing. Although antiapartheid protesters have been highly visible on campus for the past two years, this year's protests "have been provocative and illegal from the beginning," says university spokesman Ray Colvig. The university has responded, he says, with tough measures that have not been used since the Vietnam war protests -- the use of force by police, banning about 40 nonstudent activists from campus, and raising the possibility of suspension or academic probation for protesting students. Our protests were provocative and illegal? Our protests in solidarity with those struggling for their lives against apartheid? Oh my! While Chancellor Dirks wasn't at Berkeley during the 1980s anti-apartheid movement, he was a professor on another university campus at that time (the California Institute of Technology, a.k.a. Cal Tech). He cannot have been unaware of anti-apartheid activism that swept hundreds of universities in that era. So I think it's reasonable to expect that the Chancellor -- an historian -- had sufficient context to reflect on the role played by leaders at the institution he now heads, rather than to blithely appropriate credit and pride for a movement his office opposed. But better to acknowledge history than to smother it in nostalgia. It's particularly necessary to acknowledge history when the risk of repeating historical mistakes remains high. How high? Have a look at this recent video of UC Police beating a crowd of students and faculty (and, if you like, my analysis of what happened, and how the UC Berkeley administration so badly mishandled the campus Occupy Cal protest on 9 November 2011 that then-Chancellor Birgeneau had to walk his initial statement pretty much all the way back: When authorities equate disobedience with violence). What's a good model for institutional evolution in relation to activism, in which the institution does frankly acknowledge history? The Free Speech Movement pitted Berkeley students against a university administration intent on keeping a national struggle for civil rights off campus. In a very small nutshell, the administration lost that fight, and the university became a better institution for it. Now, and since February 2000, the campus undergraduate library's entrance is flanked by the Free Speech Movement Café, privately funded decades after the fact ... but with the administration's permission and support. At the café, tables display flyers and newspaper articles under their clear acrylic surfaces that convey a history of the FSM through primary materials: students and other visitors can see and interpret for themselves. The space is used explicitly to generate critical discussion about contemporary social and political issues ... that is, for the very same, prohibited 'extra-curricular' activity that the FSM had to fight for in 1964. Yeah, you might detect a whiff of nostalgia beneath the heady perfume of espresso, but sentimentality is tempered by focus on actual issues, tensions, conflicts, resolutions ... and history. I think that renaming Lower Sproul would be more than fitting. It would be a way to set a struggle for justice mounted in the 1980s into the very infrastructure of the campus, a struggle that pitted students, staff, faculty, and community against the poor judgment of Berkeley's administration (since corrected). Doing so might help to counter the facile, grating, but nonetheless persistent mainstream media narrative that student movements for social, political, and economic justice began and ended "in the sixties," a falsehood at Berkeley and elsewhere. You can support renaming Lower Sproul Plaza for Nelson Mandela on Facebook's CalMandelaPlaza page. You're entitled to an opinion, because you're almost certainly affiliated with the Berkeley campus. Even if you're not a student, alum, or employee, you help fund the institution if you pay taxes in California and/or the United States: UC Berkeley is a state university, and received a third of a billion dollars in federal research funding in 2013 alone. Make your voice heard. As members of the Campaign Against Apartheid, and participants in Berkeley’s diverse, multi-group, multi-racial anti-apartheid movement, we thank Chancellor Dirks for his recognition of what we accomplished almost thirty years ago. While the current chancellor now celebrates that accomplishment and that commitment, it is important to recall that back then both the system-wide and Berkeley campus administrations were hostile to the movement. Why their hostility? Because since the 1970s, anti-apartheid activists at UC Berkeley (and at all the other UC campuses and at hundreds of colleges and universities nationwide) made our demand not of the Apartheid government but of our own institution. We called on the UC Regents to fully and immediately divest -- to sell off -- all UC investments in companies and banks that operated in or loaned to South Africa. That local focus as part of an international effort against racial oppression gave the movement great appeal and power. The UC administration, however, (like campus administrations across the country) depicted foreign companies as a progressive force for change in South Africa, despite what Mandela, the ANC and every other anti-apartheid organization in the country had been saying for decades. Even black labor unions in South Africa -- with their own jobs to lose -- had called for corporate withdrawal from their country as part of a broad strategy to isolate and weaken the Apartheid regime. But the UC president and a majority of the Regents kept increasing their investments in those companies. By the 1980s, UC had by far the most South Africa-linked investments of any university – more than $3 billion. University authorities did not oppose the divestment movement with words and ideas alone. The Berkeley administration endeavored to physically intimidate the movement, especially the group we were part of, the Campaign Against Apartheid. For 18 months, when persuasion and enticement didn’t work, the administration used campus police (and eventually a dozen other police forces) to confront and suppress demonstrations -- strong-arming, punching, kicking, clubbing and otherwise assaulting, injuring, arresting and jailing students, employees and community members as they gathered, chanting ‘Free Nelson Mandela’, on Biko (Sproul) Plaza and at Crossroads (California Hall) Shantytown. Police seized divestment leaflets, wrestled away our literature tables, confiscated sound equipment and ripped down anti-apartheid banners, symbols and signs. The administration bullied students with bannings, monetary fines, conduct code hearings, and threats of suspension and expulsion. Galvanized by the administration’s repression of campus protest and by the greatest uprising in South African history, Berkeley students and employees and community members from around the Bay Area created in the mid-1980s what remains the largest and most sustained militant movement on a campus since the Sixties. We were also successful. Not mentioning either the movement’s focus on changing university investment policy or the reaction of UC officials and the Berkeley campus administration obscures what happened at that time. So, while pleased that Chancellor Dirks has proposed an educational event about Mandela’s accomplishments, we would like to suggest a program that also examines Berkeley's divestment movement. More permanently, the suggested re-naming of Lower Sproul as Nelson Mandela Plaza could be augmented with a permanent installation or exhibit documenting the contribution of Berkeley students, staff, and community in supporting the anti-apartheid struggle in South Africa. 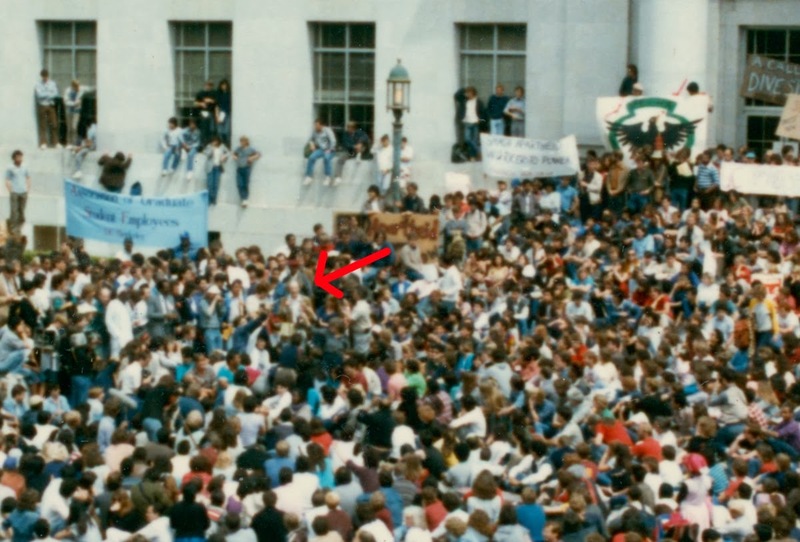 Again, thanks to Laura A. Watt for permission to use her photograph of Mario Savio speaking at an anti-apartheid protest on Sproul Plaza in 1985. A Daily Kos diary by HamdenRice dated 29 Aug 2011 crossed my radar this morning (Martin Luther King, Jr. Day in the United States), thanks to a FB friend with whom I worked briefly in a Bay Area activist group (he now lives elsewhere). I have nothing to add to the unadorned link, below, other than the hope that more people read it because of this link than might otherwise find this piece. The diary: Most of you have no idea what Martin Luther King actually did. It's one of the most powerful accounts of how political activism transforms the world that I have ever read in the essay form. Thanks to CJ for pointing me to HamdenRice's diary on Daily Kos; and to the Minnesota Historical Society and Wikimedia Commons for the image of Dr. King. Nelson Mandela spoke at the Oakland Coliseum in June 1990 to a crowd of almost 60,000 people. It had only been a few months since his release, in February, from imprisonment of more than 27 years. I was privileged to be there. Few occasions in my life have moved me as much as hearing Mandela personally and specifically address those of us who acted in solidarity with the struggle against apartheid in South Africa. What I still remember -- incorrectly according to clear evidence -- is that Mandela mentioned the student organization I worked with as part of the anti-apartheid movement on the UC Berkeley campus, the Campaign Against Apartheid. I remember that he called the CAA out by name. But he didn't. What I remember didn't happen. That's humbling, and a valuable reminder of the fallibility of wetware. Mandela referred to our struggle to force the obstinate Regents of the University of California to divest the university's holdings in companies that did business in South Africa, which was the struggle in which CAA vigorously participated; but he didn't mention our organization by name. The difference doesn't change the meaning and importance of Mandela's speech in my life; but I am corrected nonetheless. Mandela's speech begins at about 4'30", and concludes around 26'30" of the video. Listening and watching to the footage several times, I made a transcript of Mandela's speech (another on-line transcript, posted on Inside Bay Area News and credited to Mercury News, contains a number of minor errors; I believe my transcription is more accurate). I'm including my transcript here, for the record. Mayor Lionel Wilson, Congressman Ron Dellums, distinguished officials of the cities of the Bay Area, sisters and brothers, comrades and friends. On my release from jail last Feb. 11, we walked out of the prison gates to a tumultuous and joyous welcome. Our people in their multitudes had come from all corners of South Africa to receive us back into a world of struggle. The heaven rang with their chants of joy. Ten days ago, my delegation, my wife, and I stepped, stepped on the soil of this United States. Once more, we were received with overwhelming tributes of friendship and solidarity. This spirit has been repeated in every city we have visited. We have witnessed support for the fight against apartheid and for human liberty and peace in South Africa. It is clear beyond any reasonable doubt that the unbanning our organization came as a result of the pressures exerted upon the apartheid regime by yourselves. By yourselves, as part of the international community, and by the determined actions of our struggling people. You have inspired us beyond imagination. On behalf of the African National Congress and its entire membership, we thank you for your solidarity. It is a great honor for us because in fact it is a tribute to the fighting spirit of our people. We say it is a tribute to the fighting spirit of our people, who are also your people. We know that this rally was made possible by the unity in action of all sectors of this community. Today in South Africa the same spirit has begun to break down the walls of apartheid. There are many obstacles ahead of us both [?] and [?]. Many apartheid laws are still on the statute book. The freedom to conduct a political organization is still threatened by the state and right-wing vigilantes. Our schools are still segregated and inferior. Medical services are inadequate. Unemployment is high. Housing is scarce and the masses of our people are still without land. It is our responsibility as the national liberation movement to take action for change. Our movement is now accepted after three decades of illegality to operate officially. The task ahead is daunting, but our resolve is strong. In addition, our people are determined to fight for liberty until victory is achieved. The people's campaigns, carried out with amazing courage and great sacrifice, have pushed the government to concede the legal space for a widened political participation. We are at a crucial historical juncture. We cannot turn back. We shall not turn back. We need your support for this final stage. Now, more than ever, we call on you to redouble your efforts. We have spoken elsewhere of the inspired actions of great Americans such as Martin Luther King Jr., Malcolm X, Fannie Lou Hamer, John Brown, and many others. Together we must rekindle the spirit of strength and beauty, and dispatch racism once and for all from human society. We are committed to the establishment of a united, non-racial, non-sexist, democratic South Africa. We demand one person, one vote on [sic] a common non-racial court of law. Our people demand democracy. Our country, which continues to bleed and suffer pain, needs democracy. Our country stands on the threshold of fundamental change. But we still have a long road to travel before reaching our destination: freedom. As long as apartheid, as long as apartheid is in place, we appeal to you to maintain sanctions. That is a certain way to reach our objectives. We must keep the pressure on apartheid until victory is achieved. We salute the state of California for having such a powerful, principled stand on divestment. We salute members of the International Longshoremen and Warehousemen Union Local 10, who refused to unload a South African cargo ship in 1984. In response to this demonstration, other workers, trades people, community activists, and educators gathered each day at the docks to express their solidarity with the dock workers. 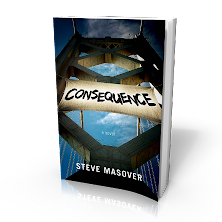 They established themselves as the front line of the anti-apartheid movement in the Bay Area, and they laid the basis for the Bay Area Free South African Movement. This movement has performed meritoriously in our support, and we were grieved to learn of the death of John George, the chairperson of the Bay Area Free South Africa Movement. BAFSAM also acted in concert with the University of California Faculty/Student Action for Divestment by marching onto campus in solidarity with the students. Finally, the regents of the University of California voted to divest. We also note that throughout, BAFSAM has emphasized the demand for our freedom and that of all South African political prisoners. We celebrate with you the imminent birth of a new South Africa in which all shall be equal, irrespective of race, color, gender, or creed. We bring you greetings from comrade Oliver Tambo, our president. I must add that since my arrival in this country, I have received several letters from organizations and individuals from the first American nation, the American Indians. In addition to these letters, I have received valuable, if not priceless gifts from them. Just this morning I received a number of gowns from them. They had wanted to robe me at the airport, but unfortunately our convoy left the airport before arrangements could be made for them to perform the ceremony. When the robes came, and their letter, I was already here. I then requested the mayor to allow me to meet this delegation, which is led by Mr. or Miss Cooper. Unfortunately, we were unable to contact them despite the diligent inquiry by the mayor. These letters which I have received describes [sic] the conditions of the American Indians here, and I can assure you that they have left me very disturbed. If I had the time, I would have visited their areas, spoken to their leaders and their organizations, and got from them an authoritative picture of the difficulties under which they live. But, unfortunately, my schedule is very tight, and I cannot carry out this wish. But I can assure the leaders of the Indian community that I will return in October. With the permission of my organization, which I am sure I will get, I will visit the Indian areas in this country and get a briefing from the Indian community. We will exchange views as to what I could do to help them in their struggle. In the meantime, I want to tell you that Oaklands [sic] is the last city that I am visiting in the course of my tour. Let me assure you that, despite my seventy-one years, at the end of this visit I feel like a young man of thirty-five. I feel like an old battery that has been recharged. And, if I feel so young, if I feel like an old battery that has been recharged, it is the people of the United States of America that are responsible for this. It is you, the people of Oaklands [sic], the people of the Bay Area, who have given me and my delegation strength and hope to go back and continue the struggle. You must remember that you are our blood brothers and sisters. You are our comrades in the struggle. Remember that we respect you. We admire you, and above all, we love you all. Talking about the weather used to be small-talk, right? Nowadays there's something more sinister in the topic, at least from this observer's frame of reference. The sun is shining in the San Francisco Bay Area, and it creeps me out. The coldest weather in years will be making its presence known from the Upper Midwest to the Mid-Atlantic region for the beginning of the work week. The polar vortex, a mid-upper level cyclonic feature normally present over northern Canada, will be displaced unusually far to the south over the northern Great Lakes and southern Ontario. Owing to the deep layer of the cold air mass, this will provide for an incredibly strong surge of bitterly cold Arctic Air along with gusty winds. The Upper Midwest will be affected first by Saturday night, and the brutal conditions will continue pushing southeastward to the Ohio Valley and Mid-South by Monday, and to the Northeast and Mid-Atlantic by Tuesday. Particularly noteworthy will be the extreme wind chills and nearly unheard-of daytime highs that are forecast. A huge expanse of wind chill warnings are in effect from Montana all the way to the central Appalachians, with wind chills on the order of -20 to -50 degrees expected! Afternoon highs on Monday for parts of the Midwest states and the Ohio Valley will fail to reach zero degrees! Here in Northern California? Mild. Clear. Dry. A cousin in Orange County reported seventy-seven degrees where she lives on Sunday. 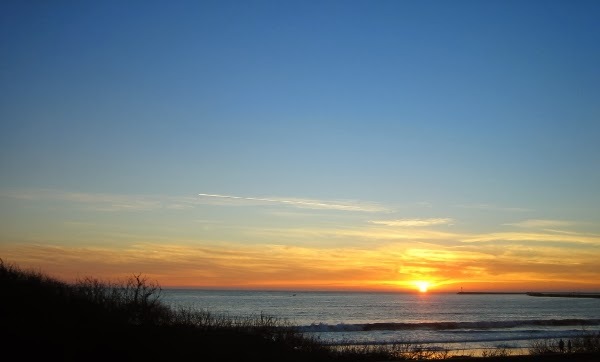 The photo at left is sunset on Saturday evening at Half Moon Bay (higher res on Tumblr, at One Finger Clicking). I drove along a stretch of about ninety miles of Highway 1 on Friday, and back again on Saturday. Both days there were surfers in the water from Pacifica to Santa Cruz. I'm not gloating, mind you. Like I said: there's something sinister about the weather this winter, whether it's bitterly cold and snowy on the east side of the continent or summery and dry on the lower stretch of the Pacific side of the country. And it ain't just California that will suffer for that deficit. The Golden State, with a population of nearly 12% of the entire U.S., produces nearly half of U.S.-grown fruits, nuts, and vegetables. 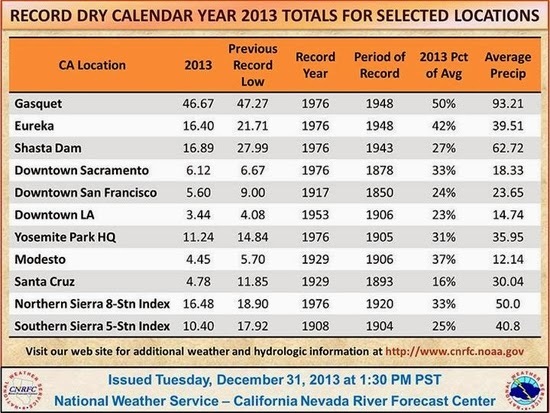 California water supplies were in good shape entering 2013 but they are rapidly deteriorating now. Snowpack levels are just 20% of normal on January 3, 2014 according to automated measurements. There's no end to the west coast drought in sight. The Climate Prediction Center outlook for California is for worsening drought for the next 90 days. The January outlook is very disappointing because January is frequently California's wettest month. We really don't have models for how this is going to play out. There's just no way we can predict what's going to happen at this point. Climate Chaos is here and we're going to have to deal with it. Draught one year, massive floods the next, who knows what in the following year. And the severity will be like nothing we've seen. Every couple of years will see "1000 year floods" or "once in a life time events". W[e] didn't just break the sky, we annihilated it.